Arthur Lucan goes into overdrive as the title character in this manic comedy about a theft from the safe of the food controller. It’s really annoying. Someone has robbed a list of foods to be rationed from the Food Controller’s safe. The plan is to hijack what’s on the list and sell it on the black market. After finding her fingerprints on the safe, the building’s charwoman, Mother Riley is suspect number one. At the police station, Inspector Victor Cole tells her to keep her eyes open and report anything suspicious. One night she answers the office phone. It’s for the clark Mr.Danvers. No name or message. In the hall she sees Danvers using a pay phone. When he leaves she goes into the phone booth and sees the name Popplewaite underlined. She goes to his house and asks his housekeeper is she wants the steps washed. Nope. That doesn’t stop her from talking her way in and seeing that his larder is full. She makes out a report and her daughter Kitty (Kitty McShane) will deliver it to her boyfriend, Inspector Cole. There’s a break as Kitty sings a couple songs. Mother Riley and Kitty arrange to meet Mr. Popplewaite on the road. He takes them to a fancy hotel for dinner. He insists on a certain table. The waiter is his contact for black market goods. Later Cole thanks her for her service and he and his men will take it from there. That’s not going to stop Mother Riley from pursuing the crooks on her own. She hides in a hijacked lorry and ends up at the crooks warehouse. Can the cops get there on time to save her? Lucan and McShane were real life husband and wife and had a music hall act for forty years. 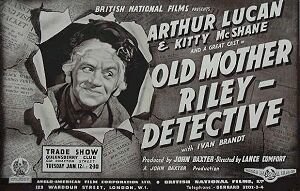 They starred in a number of Mother Riley movies in the 40’s and 50’s. If you have to see at least one of them, check out 1952’s “Mother Riley Meets The Vampire” aka/”Vampire Over London” with Bela Lugosi. Kitty is not in this one. This entry was posted in Bela Lugosi, British Movies, Comedy, vintage movies and tagged Movies. Bookmark the permalink.